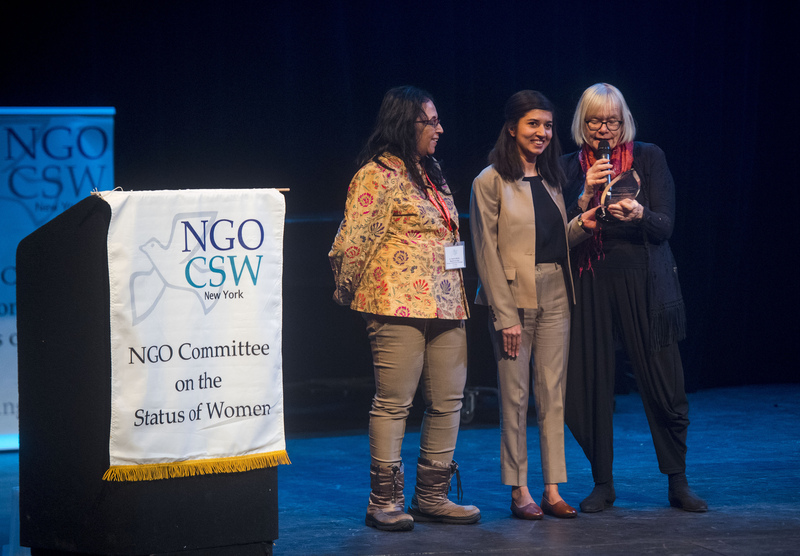 “An early start on a crisp cold morning brought us to the NGO CSW63 New York Consultation Day. It was a great start to the days ahead, meeting women from throughout the world, all with like-minded passion and determination to make a difference. 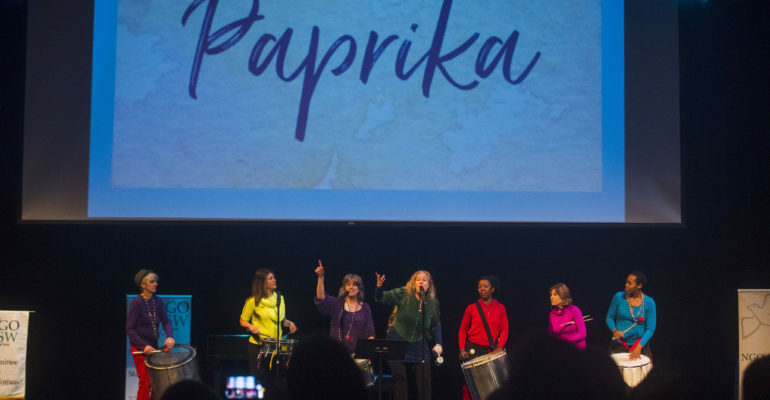 Paprika’s performance of drumming and international music sent a message of determination to raise the volume of the voices – women will be heard. Susan O’Malley Chair of the NGO Committee CSW New York, stated that 9,000 people had signed up for CSW63 the largest number ever. Not all had arrived yet but over 4,000 were expected. Networking was essential to strengthen our work on social protection systems and develop a sustainable infrastructure to move women’s empowerment and gender equality forward. O’Malley explained that Social Protection is a vision of society grounded in human rights. The International Lanor Organization (ILO) states that flaws are defined in all areas and there is a need for National Governments support and solidarity for both rich and poor. The reality is that global inequality is growing, austerity biting. Therefore, it is crucial that national governments implement the SDGs :1 poverty; 2 zero hunger; 3 good health; 4 quality education; 5 gender equality; 6 clean water; 8 decent work; and 9 infrastructure. Phumzile Mlambo-Ngcuka, UN Under Secretary – General and Executive Director UN Women, H.E.Ambassador, Geraldine Byne Nason, Permanent Representative Mission of Ireland and Bureau Chair of CSW63, and moderator Sherine Tadros, Head of NY Office Amnesty International, spoke of concerns over unpaid care and how women of the world have the burden of care – social protection does not extend to many parts of the world and mothers and grandmothers often shouldering the burden. Providing social protection across the whole range of issues enables women to move up in the labour market. Women should be able to start, leave and re-enter the labour market without penalty. Presently there are more female graduates than men, but more men in the labour market? Recognition and thanks was given to all civil society for everything they do and they were asked to please keep doing it! CSW63 is breaking new ground designing frameworks with a degree of latitude. Social Protection and our progress is not an end in itself. It is not power over men we reach for but power over ourselves. Where we have blockages every day – take action. ‘Me Too Movement’, is a powerful awakening of political activism of women. Young women in particular should be at the table. How can we change the energy? Strengthen lobbying for the rights of women and girls. H.E Ambassador Geraldine stated, 2020 is the Bejing Anniversary, use it to take BIG BOLD STEPS and demand implementation of human rights. UN Women will also celebrate its 10th Anniversary in 2020. Now is a critical moment to lift the agenda and in the two weeks of CSW63, it is important to identify and focus on areas to work on, to achieve the outcomes of CSW63. the Ambassador said people were tired of tradition and culture being given as excuses and stumbling blocks. We cannot afford to not reach the ambtions of the UN and UN Women, and fail to reach agreed outcomes. We need solidarity . Phumzile implored the delegates to work together for agreed outcomes, to keep the ship floating and to engage with countries, monitor the situation and not take us backwards from where we are today. Gharsanay IbnuAmeen is the youngest woman ever to be handed the Woman of Distinction Award, aged 24 years. She worked tirelessly with long days studying and gained a scholarship to further her education and now works with young women around the world gaining understanding at grass roots. She has travelled in remote areas of Afghanistan, in Taliban areas, praying nothing would happen to her. Her belief is that all should have the opportunity to be educated. 140 million not in school and half are girls; empowered women need to stand up for women, in harmony, love, respect of each other; unite young leaders across the world, with equal rights for everyone; with the role of the UN crucial. Climbing PoeTree then gave a wonderfully entertaining programme of poetry and verse with some memorable words, messages and food for thought. The panel that followed was Social Protection: Definition, Context and Vision with panelists Vinicius Pineiro, Deputy Director of the UN International Labour Organization, speaking on the importance of language in CSW63 text, making sure we have written conclusions and that we should also ‘raise the bar’, not ‘lower the bar’. If you over promise on Social Protection and it is not sustainable you create a problem for the future. There is a revolution going on in parts of the world and 1951 Refugee Convention needs to be a recognised bench mark. CSW63 is contributing to global conclusions and history for future generations. Nadia Daar Head of Washington Office Oxfam spoke of the billionaires created every 2 days, creating jobs for others. Dizzying amounts of wealth, inherited or self-made on the back of many hard working men and women. People who stitch and make our clothes etc, with the rich earning in 4 days their life time’s earnings. She stated that inequality is growing in countries with unpaid care work. Way forward is to provide a universal policy for social services and social protection, publicly funded. The government must make a political choice and budget. Respect Union Rights and make Women’s Rights comprehensive. When have civil society had space to influence fair tax reforms? Memory Kachambwa Executive Director of FEMNET Kenya works with 600 women’s organisations in 48 countries. She spoke on policy shifts for woman and girls at micro-level, equality for women and justice can be achieved if educated. A case study highlighted corruption using public finances and cost of hospital building being 80% over budget, with no transparency of accounting. Africa losing a $100 million a year . Women under represented and at an African Conference there was only one gender session with the male given over an hour to speak and the female just 5 minutes. She concluded with women of Africa as drivers of change, dignity and happiness. A request for more aggregated data but also the importance of qualitative date so the stories of the people not captured in quantitative data can be heard. Corina Rodriguez Enriquez, Argentina DAWN spoke on Latin America fiscal constraints, poverty and inequality. In the last 20 years social protection progress has experienced a move towards a human rights approach. Increase in education investment, extension to social benefits, cash transfers and care issues. Attention given to care issues with the national care system most solid. Charities dealing with how to build social floors and conditional to non-conditional benefits, contributors to non contributors and integrated care issues. There is now a political shift to return to economic policies. Corina stressed that Feminism is hope; women are hope; most vibrant, organised, prominent, collective and alternative.